Whether we're designing for a residential project or for a commercial client, we pride ourselves on incorporating unexpected design elements, captivating focal points, and utterly unique artwork. Sometimes, all three of these design features come together in a truly stunning way: in the form of a mural. 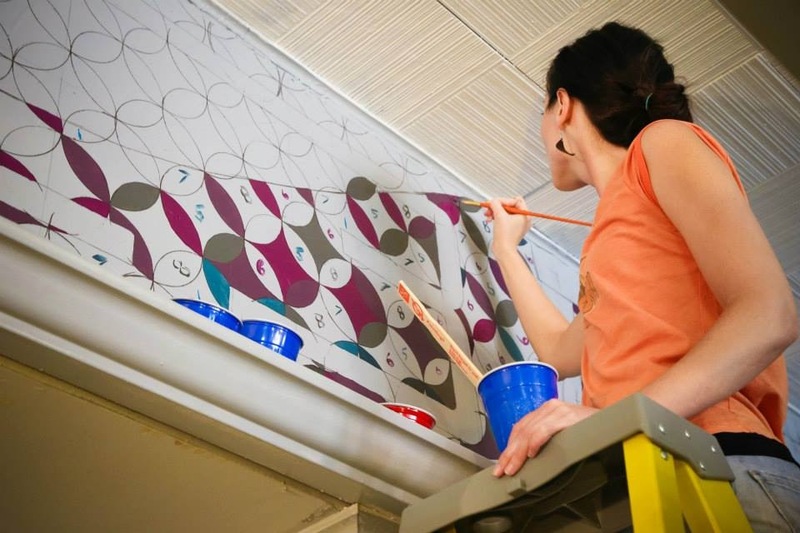 Crimson Design has been working with Sarah DeAngulo Hout for over eight years, commissioning truly one of a kind murals for some of our favorite clubhouse projects. Whether we give her a clear vision, or we give her full reign over what she paints, she never ceases to amaze us with her command of color, artistic aesthetic, and versatility. This is why painter, illustrator, and muralist Sarah DeAngulo Hout is one of Crimson's Favorite Creators. Sarah's artistic journey began at a young age. As a child, her favorite times in school involved making crafts. In high school, she explored typography and designing logos for student government campaigns and events. During her high school career, she'd never felt sure of what she wanted to do with her life. Art never felt like a viable career, that is until the last few years of high school, when fate intervened. She enrolled in a college level art class her senior year of high school to develop the foundational skills needed to be an artist. From still lifes to figure drawing, her artistic skills suddenly skyrocketed, as if they'd been laying dormant, waiting to be awoken. Thanks to the encouragement of her high school art teacher, who saw that art was truly Sarah's calling, she decided to pursue art more seriously after graduating high school. From her small Ohio town, she took a leap of faith and enrolled at Columbus College of Art and Design (CCAD). Her first week at CCAD opened her eyes. She knew she was supposed to be there; she'd come home. Her freshman year she was given the opportunity to explore the different majors (fine art, illustration, and more). She met an illustrator that first year and something just clicked! He had worked in children's books, advertisements, board games... you name it. She loved that art could be used to make people happy, to solve a problem, and that it could exist in people's lives every day. So, she pursued, and earned, a degree in illustration. Six months passed after graduating, and she hadn't yet been hired as an artist. Until, yet again, fate stepped in. Her roommate showed her an ad Trader Joe's in Easton had placed on Monster.com, looking for a muralist. So, with her college portfolio in hand, she met with the manager of the Trader Joe's... and was offered the job on the spot. This was an exciting opportunity, as she'd never painted anything quite so big before, but Sarah relishes a challenge and dove in. The very next project she accepted was a mural for an elementary school. This project proved to be even larger than the Trader Joe's mural, largely due to Sarah's own artistic vision. When she toured the space, she was directed to a small wall and told, "This is where we're thinking of putting the mural." But, ever the one to challenge herself, Sarah turned and suggested instead, the giant empty wall to the right. From a design perspective, it just made the most sense and would make a lasting impact. Shocked, the librarian said, "You can do that...?" and with the bravado and fearlessness of an enthusiastic 20-something, Sarah responded with a breezy, "Yeah! Why not?". Very soon after this mural was completed, she began receiving calls from libraries and schools all over the city. Every teacher and librarian wanted their walls to feature the work of this fearless muralist. Sarah fell in love with mural painting . Today, Sarah takes commissions for schools, libraries, hospitals, private residences, restaurants, and more. Her favorite thing about mural painting? The human interaction. The life of an artist or illustrator can be a solitary one. Mural painting puts the artist right in the environment of the people who will enjoy their artwork every day. Schools are a particular favorite painting venue of Sarah's. After all, who wouldn't love to hear a whole class of elementary school students gasp in awe at the work you're creating, just for them? Years of experience have honed Sarah's mural painting process. In the beginning, Sarah meets with the client, ideally on site, to discuss their vision for their mural. About half the time she'll have an idea of what she'd like to do herself, but other times she'll have to sit down and research, brainstorm, and sketch out ideas. The second step in creating a mural is to sketch out the finalized idea. This starts as a small 8.5x11 sketch that is then blown up, traced, and sketched again and again until it's just right. Then, Sarah will present her finished draft to her client for critique. Once the client and Sarah agree on the design, Sarah has to problem solve to figure out how, exactly, to get the design onto the wall. About 70% of the time, Sarah can project the final image onto the wall and work from there. But, every so often, a project comes along that prevents this solution. Sarah once worked on a long, extremely narrow hallway, the shape of which precluded the use of a projector. So, instead, she gridded the entire hallway into squares and then gridded off the drawing and freehanded the mural, based on the way the wall's grid squares corresponded with her drawing's grid squares. This project took 9 months. Other times, this gridding process isn't possible either, so she has to free hand the entire mural. Once the application process has been determined, she can actually begin the painting process. If the project is outdoors, it will typically be more graphic in nature. If the project is indoors, there will usually be more details so, occasionally, she'll paint the entire mural in a sepia tone first. Then, she'll figure out the value scale of the mural, and go in with color. After that step is completed, she'll varnish the entire project. Depending on the size of the project, from start to finish her murals can take anywhere from 2 weeks to 9 months to complete. Sarah is among our favorite creators due to her extraordinary talent, of course, but also because she's constantly growing, exploring, and playing. She's a curious person and actively seeks out opportunities to grow as an artist. For that reason, her favorite projects to undertake are the kinds that let her have free reign over design and give her the freedom to try new techniques. One of her favorite projects was one she completed for a doctor's office. She had the opportunity to try a new technique with this project. Though she used acrylic paint, she decided to make the flowers look like they were painted in watercolor. 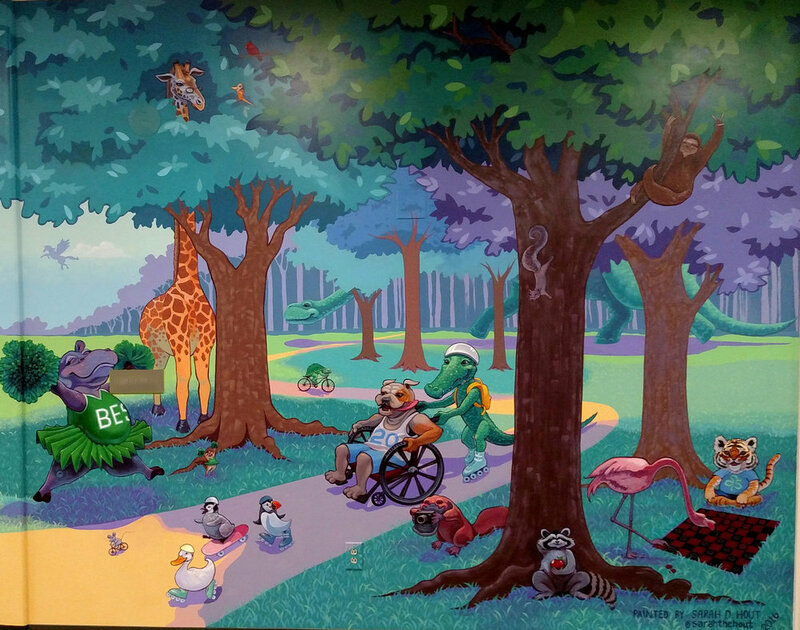 Another favorite of hers was a triptych she painted for the Big Lots Foundation for Nationwide Children's Hospital. 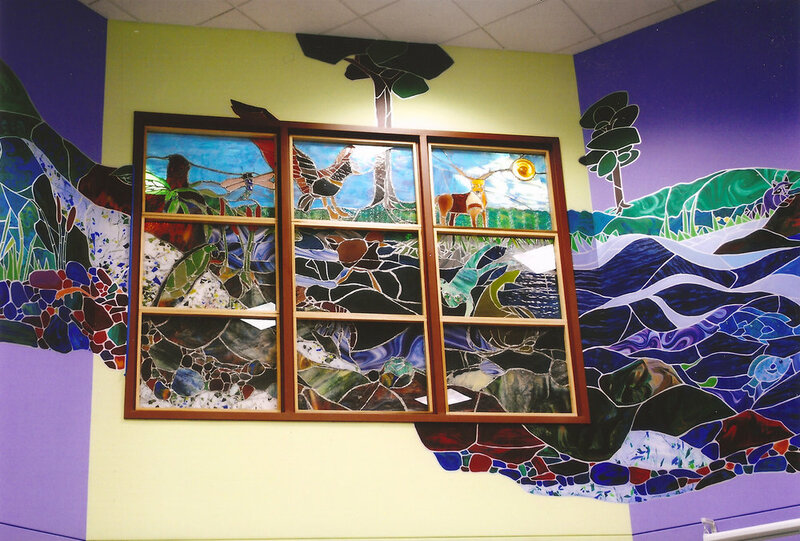 In this mural she was able to use different mediums (including paper collage and a gel medium) to create layers and visual interest in the mural. She had fun playing and creating something utterly unique. Sarah's curiosity, desire to grow, and her willingness to explore her craft make her work a perfect fit for our work. We've felt fortunate to work with her for so many years, and look forward to seeing what she does next! Interested in keeping up with our blog? Follow us on Instagram to make sure you never miss an entry!